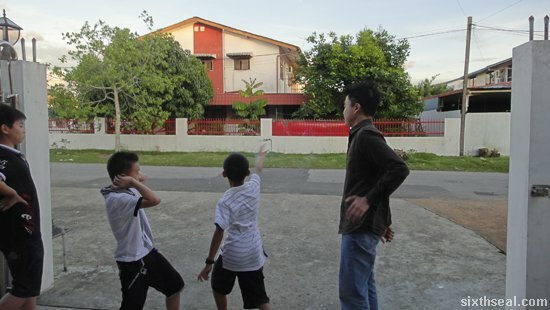 I was playing with firecrackers the day before when some kids from down the street came over. They very unselfconsciously asked if they could watch and I said sure, but told them to stand back coz I was lighting some huge aerial salutes then. One of them asked if they could play with my firecrackers and I let them fire off the the stash I brought out. I helped them light it and watched very closely as they did, telling them to be careful. 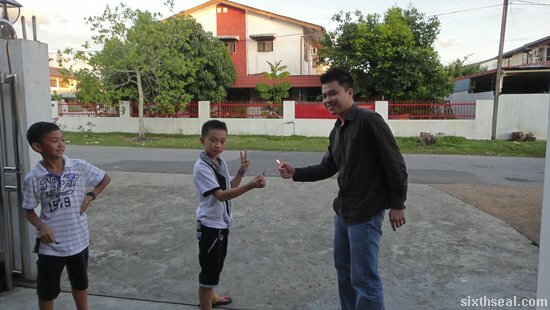 The smallest one was probably around 7 years old or so – at that age I was playing with loud salutes like chai lei so when he asked if he could light one himself, I let him have the lighter and stood beside him while he lit the fuse. 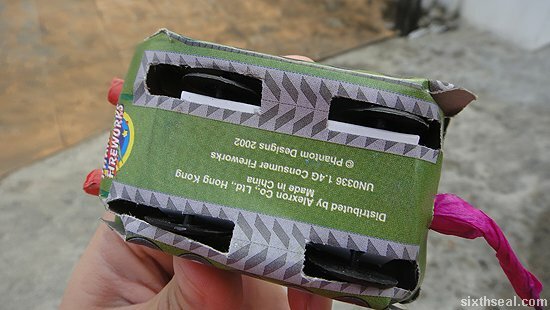 I believe with proper supervision, kids can learn how to let firecrackers off safely, like how I did when I was their age. I even let the smallest one light one of the large Crazy Bang salutes. I had to hover over him while he did it and tell him not to touch the firecracker while lighting it though. It was very tiring having to babysit but the smiles on their faces and their glee from the unadulterated fun they had was worth it. All three of them were enthusiastically taking turns to let off the firecrackers. I like them – very polite kids, thanked me for the experience. They came *running* back last night when they saw me playing with fireworks and together we finished up most of the stuff I got. This is one of the fireworks that I used to play with when I was a kid. I haven’t seen it around for *ages*. The most interesting bit about the complex (in the sense that it’s not a simple salute) build is that it behaves more or less like a tank. It has wheels that actually work and the fuse propels it forward in a surprisingly sudden fast turn and it emits a spray of sparks (which I imagine is the flamethrower) before the grand finale – at the very end the tank actually fires it’s main gun. Tame stuff, but nostalgic. 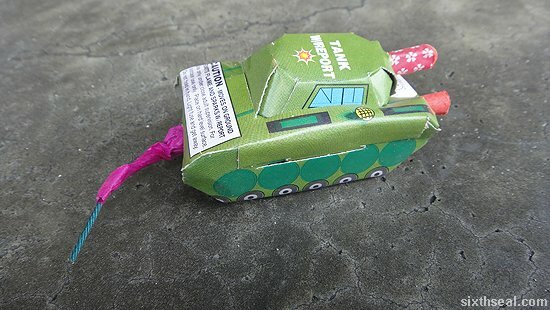 This cardboard tank spits out an arcing ball of fire which travels a short distance and explodes on the ground. It’s very cute actually. The video shows the firework tank in action – during the heydays before the firecrackers and fireworks ban, there were lots of nifty and creative fireworks like this. 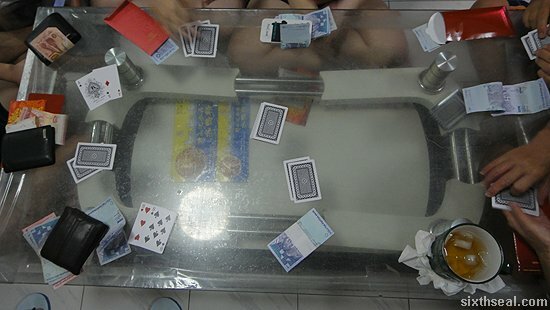 It has become a tradition that we have dinner at my grandma’s place on Chinese New Year eve before everyone plays blackjack. My uncles used to be the dealers when I was a kid but as that generation passed on, I’ve become the dealer and all my cousins come over to my grandma’s house to play. It’s small stakes only, just to pass the time until about 11 pm before I get ready to let off the firecrackers and fireworks. 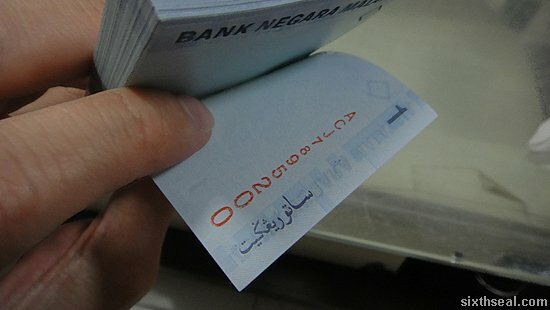 Thus, I ended up with this stack of 100 x RM 1 bills. I exchanged RM 100 for this and it’s in mint condition and still has the band on it. 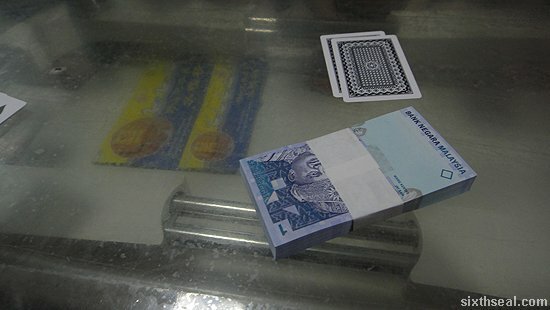 …up to ACJ7895200 – exactly 100 pieces of RM 1 notes. I also had a special jackpot giveaway where you can automatically win RM 20 from the dealer (that would be me) if you get “2012” e.g. three cards – two 2’s and a 10. It’s all for fun, just money changing hands. 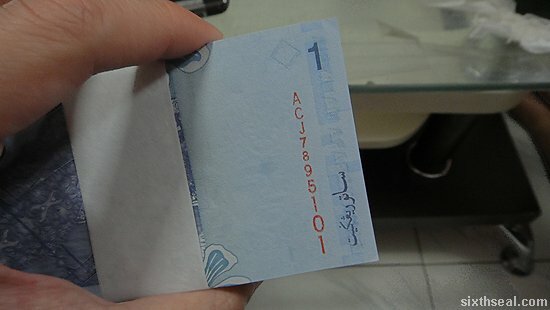 I only realized I’m up by RM 13 when I went to exchange the notes for proper ones. 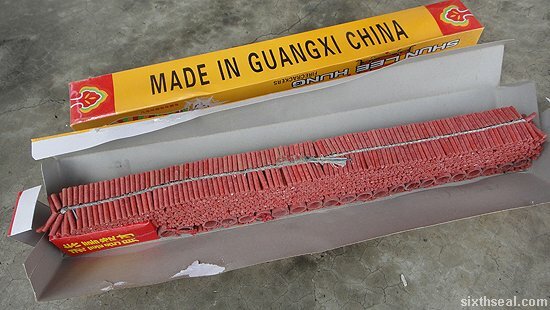 It’s the most popular firecrackers around. Shun Lee Hung firecrackers. The yellow boxes of Chinese firecrackers that goes for RM 15 each. You can’t go wrong with these…but then again it’s helluva boring to wait for the tiny plinks and plonks while the 3,000 individual firecrackers go off. …so how do we spice it up? Just open the box, drag the first strip out as a “fuse” and keep the rest in the box. Imagine the stacked firecrackers going off all at once. It’s fast. It’s furious. It’s fun. Of course, there are many times you can actually do that, those are just three personal *musts*. The acrid smell just reminds me of childhood. It’s a connection to the past. Optional: You can pick up the banner with *insert prosperous couplet* (that I can’t read) and hang it on your gate if you want. I’m not chilling at the couch back home. Well, I *am* doing that, and watching TV but that’s not all I’m doing. I’m back home for the holidays and since I nearly missed my flight, I didn’t manage to do all the chores. There are some things in life where you just have to brave the traffic and parking woes to get done. There are other things in life which you can do at the comfort of your own home, wearing comfortable clothes and generally being a slob. E-banking is one of them. I have never gone back once I started unless it’s to cash in cheques or something like that. It’s just so convenient to use a phone, tablet or PC to perform all your banking tasks. I’ve gotten so used to it that if you asked me to physically go and pay bills I’ll probably just terminate the service. Anyway, there’s this online game using the Unity engine which is also going to be available from iTunes and the Android Market. It’s called RHB Now Race – Race For a Ducati and you can actually *win* a legendary Ducati bike and other real life prizes from it. It’s pretty easy to play the game – if you don’t have an iOS or Android phone/tab – you can play the web based version here. You’re in control of a Ducati bike and you need to collect gems for 60 seconds while avoiding obstacles. The arrow keys steer the chopper and the space bar allows you to jump over obstacles. Tip: You can press the space bar twice in quick secession to do a “double jump” – twice the height and distance to clear tough obstacles. You’ll need to perform a transaction first to lock in your high score. I did 50k easy on my first run but then again I’m a gamer so these things come naturally to me. Now who’s up for beating my high score? A Ducati Monster 795 and other cash prizes await! 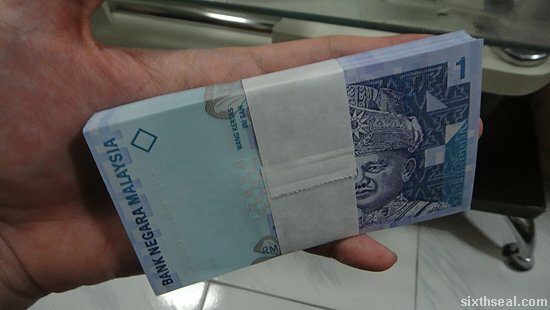 Heck, even the *consolation* prize starts at RM 7,000. Happy Chinese New Year 2012 everyone! Setting out the fireworks and firecrackers for tonight to dry out in the afternoon sun for the last time. Yes, this actually has a logical basis behind it. I’ll explain some other time. Heh. Went to see Ah Beng The Movie – a Malaysian production. It’s a Chinese New Year movie, wanted to catch one before the reunion dinner later. Anyway, the ticketing counter wrote Cineplex 2 on the stub and we waited until 3:10 pm and finally went to ask at the counter if the movie’s starting. It turns out it was at Cineplex 3. The person made a mistake. I complained and the person at the counter gave us RM 7 tickets instead of RM 9 – got RM 2 each back and got the RM 7 “movie night” tickets instead. I was pissed off coz I hate missing the start of movies but that’s the best they could do. Oh well, that’s Sibu for you. I’m about to head out for the extended family reunion dinner. 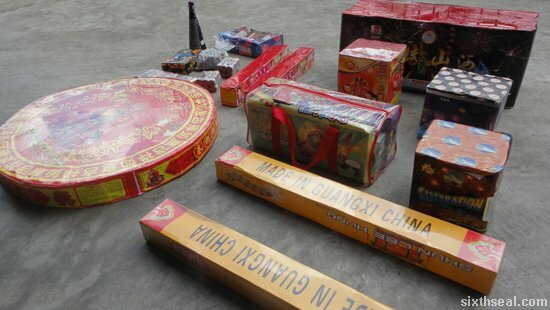 I’m bringing some Chinese firecrackers along, it’s a tradition to let it off before the dinner. 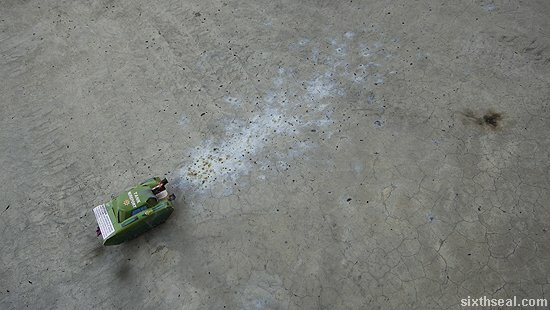 I can hear my neighbors already – the sound of firecrackers going off is almost unbroken, everyone starts burning the long Chinese fireworks before the CNY eve dinner. My dad filmed me playing with this old skool traditional triangle shaped fireworks. 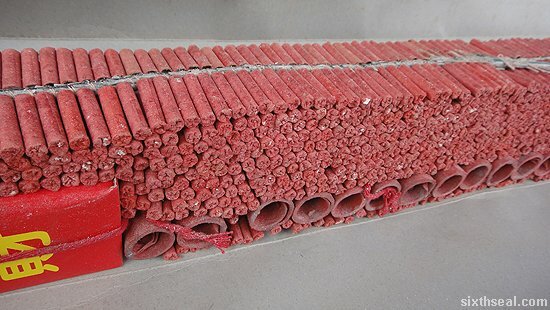 It’s called Judas Belt in the Philippines when it’s in a long string, but we get single ones over here – the Chinese name translates to “triangle firecrackers”. I do not recommend you play with firecrackers like I do, I’m actually pretty blase about these things coz I’ve been letting them off for as long as I can remember. The video is actually quite funny, you can hear my dad’s commentary. Heh. The Chinese New Year eve reunion dinner! This is my grandma. I really like her. She’s one of those people that’s cheerful and jovial against all odds. Always love spending time with her when I’m back. 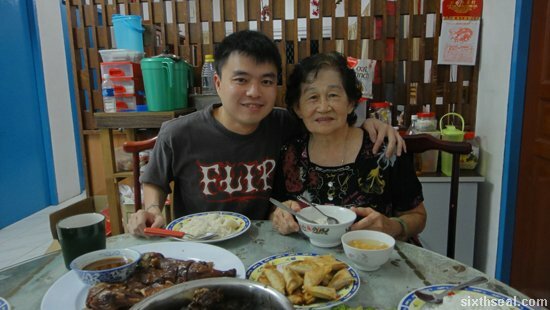 We’re Heng Huas and one cultural thing about the CNY eve dinner is that we don’t eat rice. We eat longevity noodles tossed with lard. 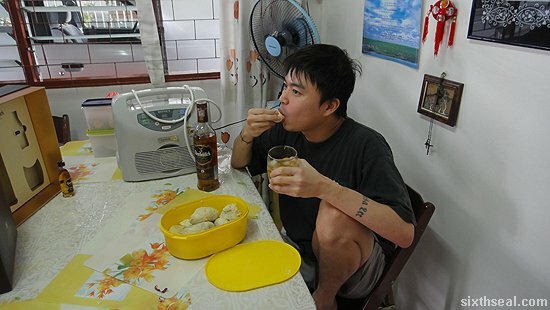 It’s not the Foochow type where you eat it in soup – that’s actually totally not cool with Heng Huas coz eating soup during the reunion dinner is supposed to make it rain. Heng Huas eat dry longevity noodles tossed with lard and some deep fried shallots for the reunion dinner. I love the stuff, it’s very flavorful and tastes good with the dishes. 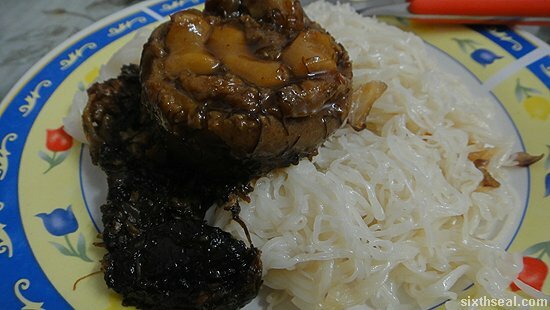 That’s one of my favorite on the plate – braised pork with fatt choy (it’s a type of bacteria, seriously). I’ll keep on adding stuff until tonight! Hello. I’ve waited here for you. Everlong. They say Singapore is the entertainment hub of Asia. For all intents and purposes, it is. Hey, we’ve all flew down to Singapore to catch all the awesome concerts and theater performances that never comes to Malaysia. I watched Ishinha’s When a Grey Taiwanese Cow Stretched last year, all done in Osakan street rap with English subtitles and enjoyed it tremendously. It’s a good thing it’s not that far away so we don’t miss much. I’ve even driven down to Singapore before. It’s very accessible, that’s for sure. Yes, the Singapore Fringe Festival is BACK! It goes on at various different locations and there are free and ticketed performances from local and international artists. One thing that caught my eye is Iraq is Flying – a collection of photographs by Jamal Penjweny. I love stuff like this. It’s one of the free events where you can view pictures of post-war Iraq and the lives of the people living in it taken by a renowned Iraqi photographer. It’s also one of the festival highlights. Get more details of the listings and at the official M1 Singapore Fringe Festival site. The Mosaic Music Festival is celebrating its 10th anniversary this year. This is a music festival that knows no genres – jazz, hip-hop, soul, electro, it’s all represented here. The theme this year will be Celebrating Life – The best of the Human Spirit through the Arts and can best be described as a call for peace and harmony. …a lot of these names will be familiar to music and theater aficionados. Get the full performance list and details at the Mosaic Music Festival site. Yes, it’s Dave Grohl from Nirvana! Everyone said they wouldn’t make it when Kurt Cobain kicked the bucket and Dave went and started Foo Fighters. Their debut album was awesome and Everlong is still one of my favorite songs. The music video for that one is *amazing*. This is for all the old skool music lovers. They were really huge in the ’90s and now they’re coming back in a big way. She has over 100 million albums sold so she’s gotta be doing something right. The co-star of Grease, her music will appeal to those who likes easier listening. Okay, I have a confession to make. I ADORED them when I was in Primary Six. I had a huge crush on Marie Fredriksson and I know most of the older songs by heart. Instead of discovering them *after* watching Pretty Woman, I *watched* Pretty Woman because one one of their tracks was featured in the movie. I see the list of songs and it all automatically plays in my mind. That was how much I used to listen to them back when I was a kid. My favorite track? Cinnamon Street. Just close your eyes and listen to the vocals. That was how music was when I was a kid. Amy Lee comes to town to rock your world! I first heard of them when they did a Korn cover. I’m a huge fan of Korn. I guess you know what kind of music I listen to with my enthusiastic proclamations of bands I like. Their cover of “Thoughtless” is quite different from Korn’s. It’s more mellow and it really highlights Amy’s melodious vocals instead of Jonathan Davis’ more raw expressions. All my hate cannot be found. I will not be drowned by your thoughtless scheming. It’s the reason I started listening to Evanescence. Well, usually things like these don’t turn out very well, but in this case it did. I was randomly surfing around when I saw a video of a flash mob in KLIA. Dammit, it was on the exact same day I flew back to Sibu from KL for Chinese New Year but my flight was early morning so I totally missed this. Anyway, this dude walks in with a guitar and one of the policeman on duty runs out and hollers at him to stop. The guy breaks into song and people started dancing and I realized it was a flash mob. However the sheer scale of it surprised me. It comprised about 100 singers and dancers and had scripted events. It was like a Hindi movie, people were recording and gawking at the performers and it suddenly segued into another song. It had English songs, Malay songs, Tamil songs, Chinese songs and I found it highly entertaining. I used to listen to Ah Niu (the local Malaysian singer) – it was one of my ex girlfriends that got me into Chinese music. There was a segment where a group of Chinese tourists came out singing Lang Hua Yu Duo Duo. It must have taken them a lot of planning – there were MAS cabin attendants joining in at the 200 strong grand finale before everyone dispersed, going their own way. The original one I saw was a recording a passenger took. The best flash mobs incorporates elements from where you would not expect it – I was surprised to see a bunch of unassuming old ladies waiting outside bursting into song. I finally found the official video for this one, it’s the complete version and the footage is taken from a variety of sources, including the CCTV cameras. I know what you’re thinking – flash mobs have been done to death. That’s true, but the sheer quality of this is like watching a musical production – one that incorporates the entire KLIA arrival hall as its stage, with several things happening at once so there’s always something interesting somewhere. It’s almost like watching an episode of Glee with the Kit Kat Klub as its cast (recognized some of them from the Tapis Rouge launch). 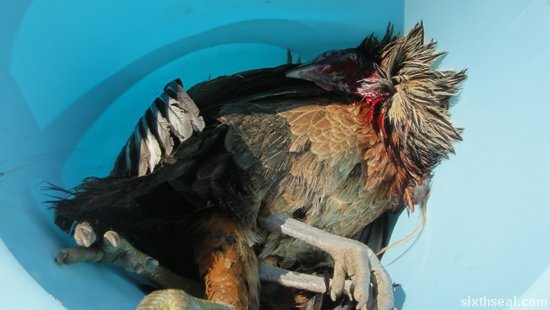 Basically, you’re supposed to dump the chicken into a bucket after you kill it coz it thrashes around quite violently. I didn’t manage to coz my hands were slick with blood and I accidentally let the chicken go. I swear, I didn’t do that just to see if it would run around like a headless chicken. Anyway, the chicken sorta flapped around all over the place when I *unintentionally* let it go. It was messy. I damn near decapitated the chicken with a very eager hand behind the knife but it still lived. It lives! Well, kinda. I finally caught it and dropped it into the bucket where it was soaked in hot water and plucked of its feathers. I didn’t do much after seeing if the idiom was true though. My mom said: Stop clucking around – if you’re not going to help and you’re just going to make a mess, go away. 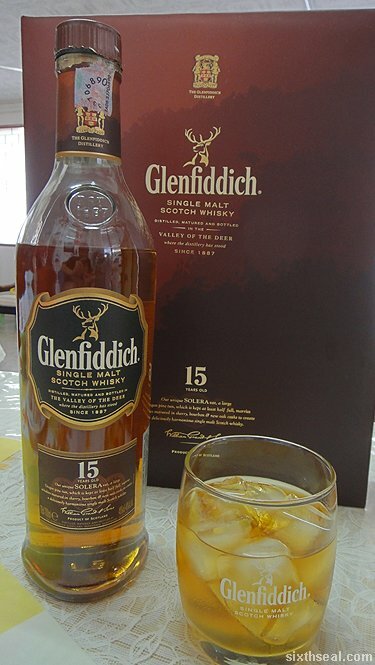 Glenfiddich is one of the most common single malt Scotch whisky there is out there. I believe I read somewhere that every 1 in 3 bottles of single malt sold is a Glenfiddich. However, just because it’s popular doesn’t mean it automatically isn’t good. I *struggled* to choke that sentence out. I’m a huge Macallan fan, quite loyal to it since it was my very first single malt Scotch and I had it at a very special time. 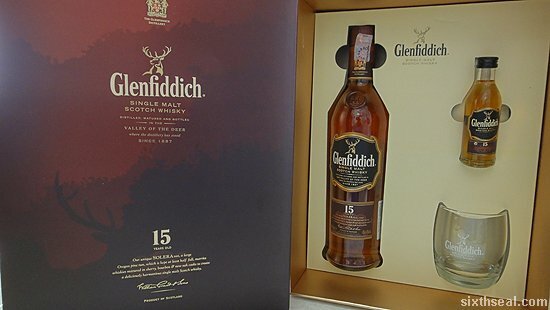 Glenfiddich Solera Reserve can be had for around RM 245 – 285. There’s this promotional gift box that comes with a 700 ml bottle, a 30 ml miniature and a tumbler. The 15 year old is generally accepted to be a benchmark of sorts and has one of the best price-performance ratios. I first had it in 2006 and wrote about the Glenfiddich Solera Reserve which I got to celebrate a pay raise. Oh, I nearly forgot this photo.